How did we get to the middle of July already? It still hasn’t rained significantly in my garden. Strange weather pattern, only a few kilometers away, they are complaining about too much rain. They should send some in my direction. Much of the garden is doing is doing amazingly well with just the municipal water and the tiny bit of rain. 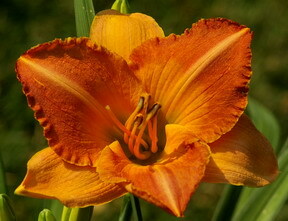 The daylilies are popping out with different varieties every day. 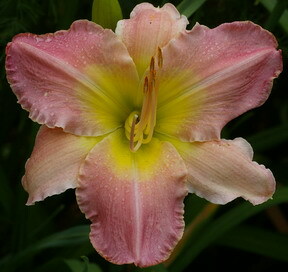 I have too many duplicate bunches of daylilies so I’m monitoring them carefully as they bloom. If I remove some of the duplicates, I’ll have room for some new ones. 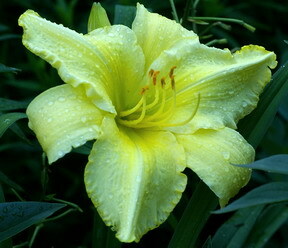 One of the joys of daylilies is their ability to be moved at almost any time. I can dig them up and divide them while they are in bloom and, although I should remove the scapes, they will actually continue to try and bloom if I let them. This allows me to move them when I can actually see, that they are the same as the one, in that other bed. How did I get so many duplicates? When the garden was new and I was eager to fill it; I would take the double clump of new daylilies and divide it into two, in order to save money and fill the garden. Now I’m digging out huge clumps. Have I got the energy to pot and label them all, so that I can hold a sale. Last year I made enough money to almost cover the cost of the new varieties that I “had” to have. Despite the attacks of the red lily bug I am renewing my old love affair with the many types of true lilies. The size and colour variations are wonderful and they take up very little garden room relative to the impressive show that they put on. I’ve developed a routine and simple program to control, (not eliminate,) the red lily bug and I can keep their damage to a minimum with a little effort and still be able to produce some amazing flowers. Lily bulbs are best planted in the fall and are usually available when the rest of the fall bulbs are in the garden centres. 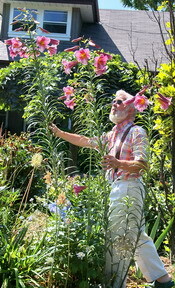 The 9 ft monsters here, take a few years to develop that large but they will flower from the first year forward. Just treat them well, good soil preparation prior to planting, and each year they will be a bit bigger. Throughout the very warm June, the Pansies in the porch planters kept on blooming while the Impatiens in the cold frame, (destined to replace the Pansies) continued to grow. They were becoming a bit anemic and the Pansies finally started to stretch so on Friday the 13th, I finally made the switch. Three days later and the Impatiens are looking great. The picture is an hour after they were planted. 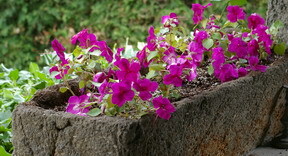 It’s bit of a pain to keep the Impatiens watered and fed but the midsummer switch is worth the effort. Every year about now, the routine of wandering around the vegetable garden, looking for something for dinner, explodes into a wealth of tasty delights. I ate the first beans this morning. No! Of course I didn’t cook them. It’s discover - pick - eat. The Zucchini are doing what Zucchini do and I have already started giving them away to the neighbours. Despite the heat bolting (see questions, below,) of, many of the cabbage family plants, the Broccoli have recovered enough to make it to tonight’s dinner table. The other big treat tonight is the stolen potatoes. The first fresh potatoes of the summer are a rare treat and not understood by those who have only eaten potatoes from a 10lb supermarket bag. Tonight we had “All Red,” a variety with a reddish flesh as well as a red skin. 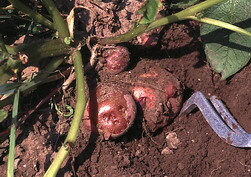 They are stolen because you dig carefully around the plant looking for a few small potatoes that you can remove, ‘steal,’ from the plant without digging it up. It then carries on through the season to produce some more delectable delights. Lightly boiled - a touch of butter - life doesn’t get much better! Readers of Dallying In The Dirt get to send me questions. Just ‘reply’ to this email newsletter and I will attempt to provide answers. The most universal questions I will answer in the newsletter so that we may all, hopefully, learn something. I have a too large an expanse of lawn to even attempt to water it. It is now very dry and brown. Will It survive or am I re-seeding in the fall? Ken Answers. Kentucky Bluegrass, the dominant plant in most temperate climate lawns, has an amazing ability to go completely dormant, (as in dry and brown,) during extended periods of hot dry weather and then make a miraculous comeback when the temperature cools and sufficient moisture returns. Relax and enjoy the time when mowing ceases to be a frequent chore. My Cabbage, Broccoli, Cauliflower and Brussel Sprouts appear to be healthy plants but the growing point, that produces the edible portion, has withered, turned black and curled up. Who’s responsible? Ken Answers. I have had a similar problem on a few plants each year and been able to ignore it. This year the majority of the crop is affected and there appears to be no causative agent. My research suggests that it is the very warm weather in June that is causing this “bolting” on the ‘cole family’ crops. 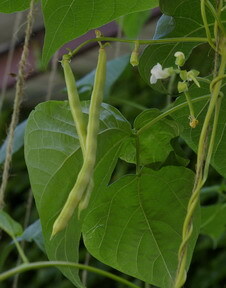 They are usually cool weather crops. Some of mine are recovering and I have started new ones of some others, that will produce their crops in the, hopefully, cool autumn weather.